Oh, wow! I love how the details are magnified through the water droplet. Beautiful! Indeed-it is mesmerizing. Great shot. Such interesting drops and the texture is divine. Waterdrops, a good idea and it looks succsessful in B/W ! The detail is indeed, mesmerizing. Brilliant! Love the textures you've created in your image. 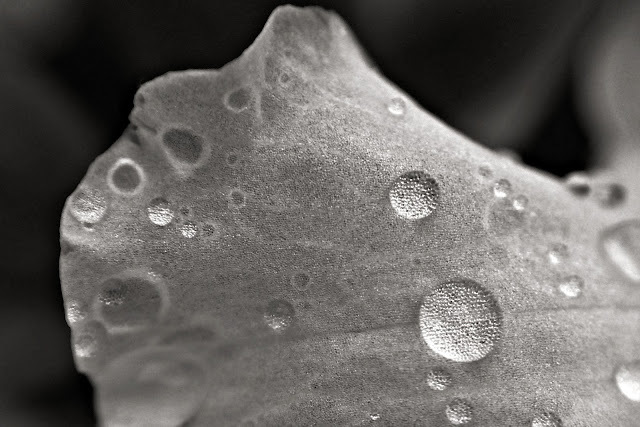 I do love a good water droplet macro. so pretty, i would not have guessed that!! it looks beautiful in b&w!!!!!! Great macro. Love the magnifying effect of the water droplet.